St. Joseph’s Day alters have popped up all over New Orleans. The March 19th holiday, that began in the Middle Ages, was brought to New Orleans by Sicilians and is still being celebrated today. Ken Weber, University Chaplain at Loyola University, said that setting up an alter at Loyola is a fun way to worship and get in touch with one’s spiritual side. Religious teacher at Mount Carmel Academy, Angela Elliott, helps organize the alter at the school. The alters are typically decorated with a variety of objects, such as cake, wine, olive oil, and special fava beans. One New Orleans resident, Burke Bischoff, has carried a fava bean he received at a St. Joseph’s day alter in his wallet for two years and knows much about them. According to Elliott, there is one main thing to remember when it comes to St. Joseph’s Day. An alter at Rouses Market on Baronne St. was set up for people to visit on March 15, 2015. 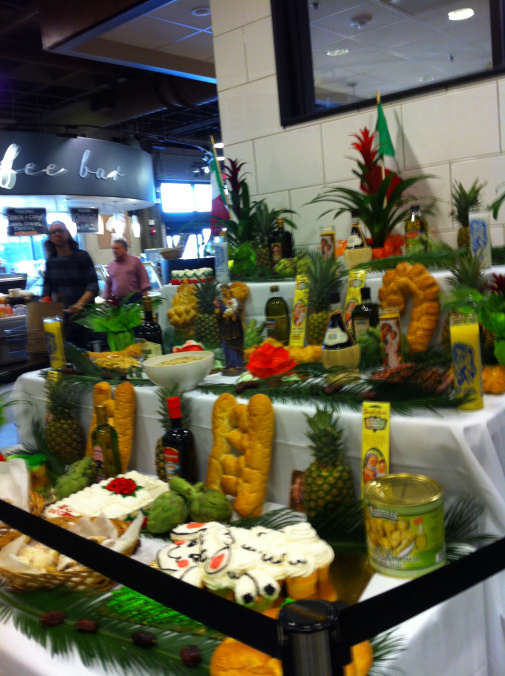 St. Joseph’s Day alters typically are decorated with cakes, wines, and olive oil.